Years before there was David Crockett but about the same time as Daniel Boone [both played by Fess Parker on TV and whom I met in the lobby of Tribune Tower as a high schooler], there was George Rogers Clark. And to me as a boy, he was a hero among heroes. Better yet, because of where I grew up– Chicago, which despite its inclinations, is part of Illinois. Clark was a towering figure in my imagination, whose exploits were in places I had actually been to in that far-away land of “Little Egypt,” the southernmost part what became a state. As I learned the story in school, Clark and a band of “intrepid” [are there really other kind, at least in myth and legend] frontiersmen almost singlehandedly drove the evil Redcoats out of the “Illinois Country.” They counted Kaskaskia, the onetime “capital” of French Canada’s southern land claims, as one of their greatest triumphs. For my family to get to Kaskaskia, we had to drive across the Mississippi River. The “capital” was now on the Missouri side because the river moved, but it was still a tiny enclave of the “Land of Lincoln [and yes, we had been often to Springfield to his home near the “new capital” and also many times to Salem where “Honest Abe” tended store, read the law by candlelight, loved and lost in a series of log cabins. Being great Illini, we didn’t visit Lincoln’s Indiana home or his Kentucky birthplace.]. Back to the Clark story. After hauling across miles of flooded countryside with thick forests, underbrush and brambles across deer paths and scaling river hill and mound after river hill and mound, he and his band of militiamen also captured the worst of the worst Redcoat, “The Hairbuyer,” Henry Hamilton at Vincennes. Yep, he was paying the Indians to massacre the heroic Americans [who were fighting among themselves as to whether this “Illinois Country” was Pennsylvania’s or Virginia’s]. Vincennes was then part of the “Illinois Country,” still on the same side of the Wabash River as Clark found it, but handed over as booty to become Indiana, now “Mike Pence Country” when it became a state. The militiamen — “Big Knives” — living across the Appalachians from most of Virginia but thinking themselves Virginians with the Old Dominion’s propensity to grab lands wherever they found it took Hamilton back to revolutionary justice, of a sort, in Williamsburg, imprisoned in irons. Through the Revolutionary War Clark, then in his middle 20’s to early 30’s — it was a long war — was working under “Give Me Liberty or Give Me Death” Governor Patrick Henry and Declaration of Independence writer Governor Thomas Jefferson. Wow, even though Vincennes was in Indiana, my family had been there as well. After all, it was only a bridge to the east across a small river with usually little water. Like most American families, we vacationed on the school calendar, so it was summer. The Wabash and all its streams were usually low, sometimes down to a trickle. In my pre-teen mind, we, a 20th century Midwestern family, had a direct tie to the American Revolution! We Were There! Even better than Walter Cronkite’s “You Are There” Sunday shows. Better yet, for Irish-Catholic kids from Chicago, you know who paved the way for all this to happen? Right again, those wonderful French-Canadian Catholic stay-behinds [most of their friends and relatives headed to nearby Ste. Genevieve still under Paris’ control following their defeat in the French and Indian War]. There was Father Pierre Gibault stepping up to the occasion and saying, George, I have a plan to take Vincennes [for the first time] and no one gets hurt. It worked! Crafty, those French; crafty those priests. 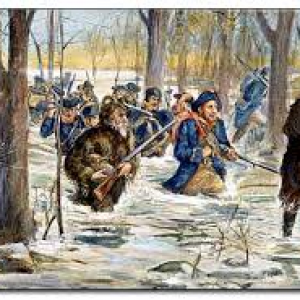 It’s when Vincennes has to be retaken from the British that Clark and the land-hungry [also physically hungry, cold, wet, exhausted and sometimes not sure where they were] Virginians, trekked through the soggy wilderness to get back what was “rightfully” theirs. This was better than every story we had to read in grammar school textbooks about Pere Jacques Marquette [has an Illinois state park named after him, as well as a park in Chicago where one of the nastiest racial confrontations of the 1960s took place], voyageur Louis Joliet [has a small city in Illinois named after him], Jean Baptiste-Point du Sable [John Baptist -Point, the Black Man, first non-indigenous citizen of Chicago, a high school there named after him]. It way topped slave-owning, protect my property against those British minions of a faraway king Charles Carroll’s signing the Declaration and his cousin John becoming the first American Catholic bishop. Clark and his guys were out there doing exciting things, beating the British, securing where I, my family and friends lived to good old America. Oh yeah, and he was an Indian fighter too. In those days, that would have been a plus. Didcha also know his kid brother was hired by Jefferson to find the Pacific with a guy with a funny first name — Mary Weather, or at least that is what it seemed to a pre-teen? The Army Historical Foundation recognized the work from the University of Oklahoma Press several years ago with its highest award for biography, but it took me this long to get around to reading it. Clark’s story is still riveting, but in far more human ways than a boy’s wild imagination trying to tie places where he has been to what and who went before in those same places and what they did. Clark never married, became an alcoholic and died a bitter man — owed huge debts for his service from Virginia at first to the Congress at the end. In large part, he paid for these campaigns out of his pocket.